Carex albolutescens.Ed Hedborn.The Morton Arboretum. (MOR) Copyright © 2014.New England Wild Flower Society.gobotany.newenglandwild.org. (Accessed 4/2014). Carex albolutescens is a perennial sedge, 30-120 cm tall, basal leaves bladeless, stems stiff, densely tufted, leaf sheaths with green veins on side opposite blade. Leaves alternate, blades 0.2-0.3 cm wide, pale green, shorter than flowering stems. 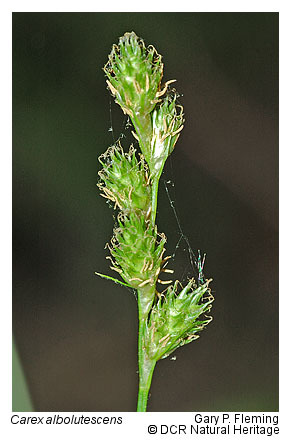 Carex albolutescens inflorescence. Gary P. Fleming. Virginia Dept. Conservation and Recreation. © DCR Natural Heritage. dcr.virginia.gov (Accessed 1/2017). Flowers densely crowded, male flowers at base of spikes, female flowers (perigynia) flat, to 0.4 cm long, about 0.2 cm wide, margins broadly winged, beak slender, scale below flower slightly longer than flower, narrowly egg-shaped, tip long-pointed; inflorescence spikes greenish to pale brown, 3-10, elliptic, about 1 cm long, the upper spikes crowded at top of stem, bead-like; general appearance like that of C. scoparia. 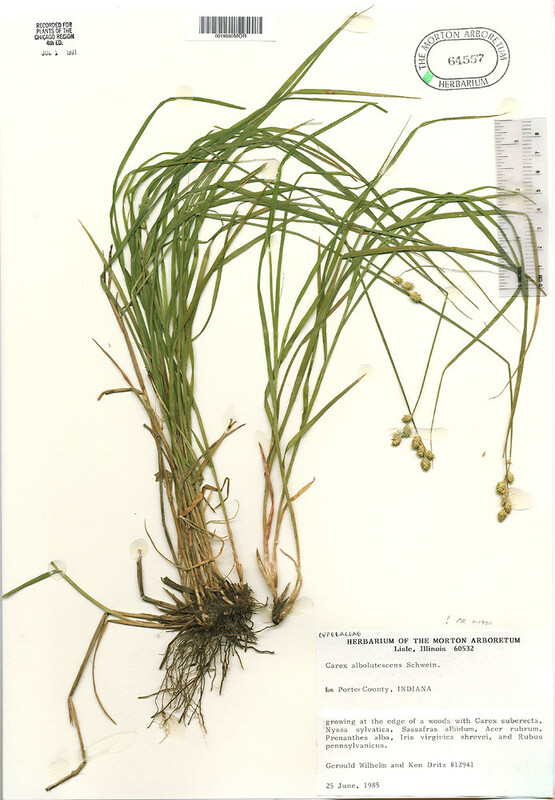 Carex albolutescens perigynia. 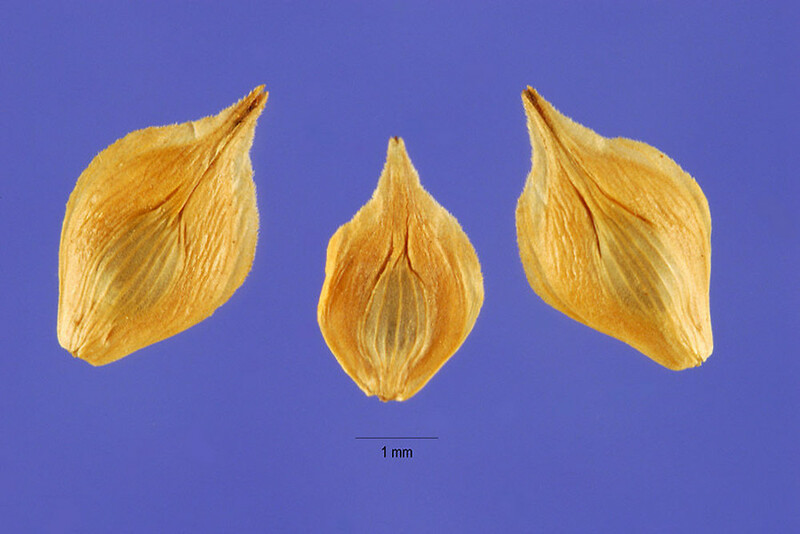 Carex albolutescens. By Steve Hurst. USDA-NRCS Plants Database – plants.usda.gov (Accessed 11/2017). Habitat: Wet woods, swamps, thickets, soil pH 4.3-7.8 (USDA, NRCS 2010).